Edo State Governor, Mr. Godwin Obaseki, has assured workers in the state, that the construction of the Labour House Complex would be completed in record time. Obaseki noted that Comrade Oshiomhole allocated the land for the project, completed the building design and came up with a plan to source fund for the project. “It was his vision that, since the state has produced great labour leaders for the union in the past, it would only be befitting to have a beautiful edifice to serve as the Labour House. Chairman, Edo State Council of the Nigerian Labour Congress (NLC), Comrade Emmanuel Ademokuo, commended the Godwin Obaseki-led administration for his worker-friendly policies, which have improved workers’ productivity. He thanked the former governor of the state for taking the bold step to ensure that Labour as a body in the state, has a befitting building to call its own. Chairman of the State Council of the TUC, Comrade Marshal Orhue, said members of the TUC are confident that the Obaseki-led administration’s developmental strides will deliver expected benefits to the state and her people. 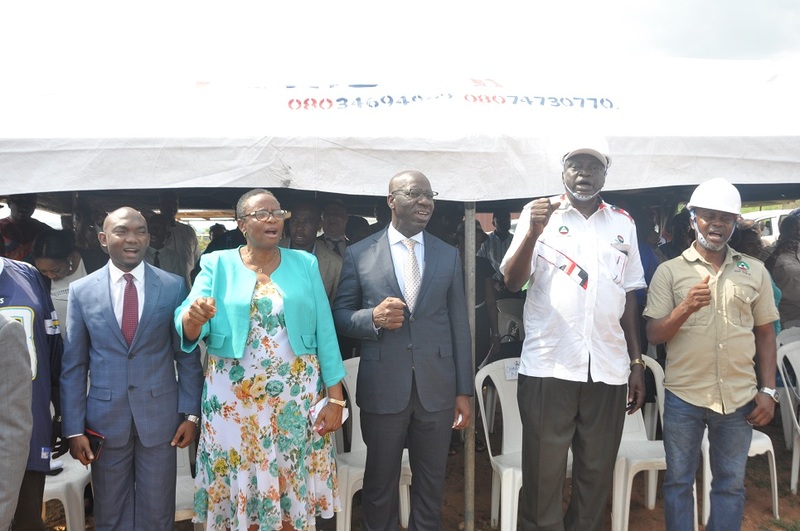 Edo State Governor, Mr. Godwin Obaseki (middle); Head of Service, Mrs. Gladys Idahor (2nd from left); Chief of Staff to the Governor, Chief Taiwo Akerele (left); Chairman, Edo State Council of the Nigerian Labour Congress (NLC), Comrade Emmanuel Ademokuo (2nd from right); and Chairman of the State Council of the Trade Union Congress (TUC), Comrade Marshal Orhue (right); during the foundation-laying ceremony for the proposed State Labour House Complex, in Ikpoba Hill, Benin City, Edo State. Edo State Governor, Mr. Godwin Obaseki (middle) after laying the foundation for the proposed State Labour House Complex, in Ikpoba Hill, Benin City, Edo State.